One of the largest user groups of laptop computers are mobile professionals. Mobile offices are now exceedingly common in todays workforce and the use of a laptop computer within the confines of the typical mobile office for many mobile professionals is mandatory. Most mobile professionals rely on their laptop computers, portable printers, smart phones and cell phones to assist them in performing their daily tasks without the need to be teathered to a typical office environment, which allows these road warriors to get as much, if not more work done in a typical day. Long gone are the days when a person would need to schedule 1 or 2 days a week to be in the office getting their "desk work" done, rather than being in the field where the real work takes place, whether that work be visiting clients or work sites. Jotto Desk will assist the mobile worker in becoming more productive while on the road. This mobile office desk has been in use in thousands of mobile offices all over North America for more than 10 years. 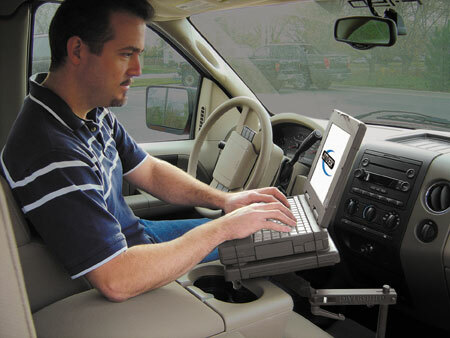 Originally designed for and used extensively in law enforcement vehicles, time and need has allowed the product line to expand beyond it's original intent, so it is now possible for anyone to use a rugged Jotto Desk in their vehicle, without compromising the original concept of having a laptop computer mount that can safely and efficiently support any laptop computer in a vehicle, even while that vehicle is in motion. Even more impressive is the fact that all Jotto Desks can be used without the need to give up the front passenger seat to the device. Learn how Jotto Desk can help you turn your vehicle into an efficient, ergonomic mobile office by choosing your vehicle type from the links below, or use the navigation on the left side of this web page to get to the complete information you need to know about using a Jotto Desk in your specific vehicle.